C. Spike Trotman and Diana Nock‘s Poorcraft: The Funnybook Fundamentals of Living Well on Less is a practical and charming comic book about being frugal. Wrapped up in a cartoony story is a collection of advice about finances, housing, food, fashion, health, transportation, entertainment and education. While a lot of the content is aimed at an American audience, there were so many tips in this book that I would have benefited from when I started University or first had a place of my own. The book is valuable beyond its advice on being smart with money. One of the most useful sections of the book explains cooking terms, provides methods for cooking and includes recipes. Sections on mending clothes, doing home repairs and researching walkability make the book a well-rounded quick resource for living well. Poorcraft is available in paper and digital versions. 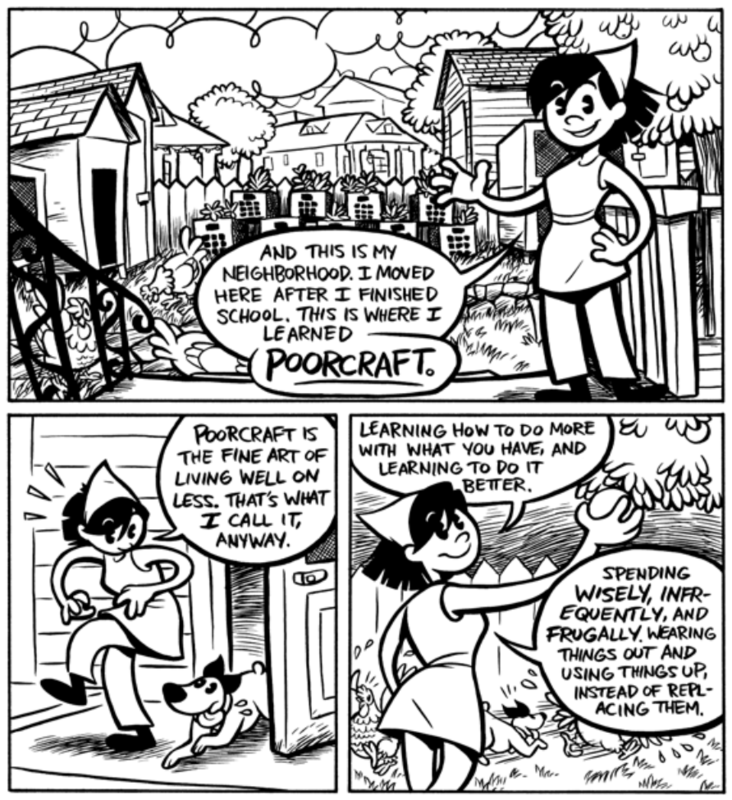 Poorcraft is the essential comic book guide to practical urban and suburban frugality! Whether you’re new to independent living, a recent college graduate or just downshifting to a simpler lifestyle, Poorcraft can help you with everything from finding a home to finding a hobby, dinner to debt relief, education to entertainment. It’s time to cut your expenses! Or just make sure they never pile up. The latest page of Strong Female Protagonist captures something simple but elusive about doing the right thing. The Intrepid Girlbot is an unusual webcomic; it’s mostly wordless, has a simple story and features a cyborg raccoon.